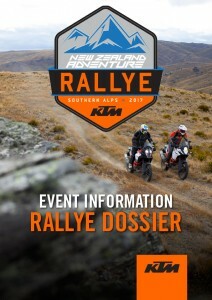 KTM New Zealand is proud to announce our second annual KTM New Zealand Adventure Rallye: Southern Alps, December 3rd – 8th 2017! For 2017, the Rallye heads to the South Island and the Southern Alps region which offers stunning scenery and epic tracks. The adventure starts at the base of Mount Cook, the highest peak in New Zealand, before heading south to Alexandra, Cromwell and Wanaka before coming to a fitting finish in the adventure capital of the world – Queenstown! Designed with the V-TWIN KTM Adventure range in mind, as well as the variety of rider abilities, the route will include a mix of tar sealed roads, back country roads, gravel roads, high country trails, river crossings galore, and much more! With the assistance of local experts, there will also be exclusive private land that will see riders exploring some truly sensational areas. The KTM NZ Adventure Rallye is about offering a great experience to our ORANGE adventure riders – and what better way to do that than with an epic 5-days exploring the South Island on your KTM adventure bike. Bring old friends or make new ones, in the spirit of adventure riding, the Rallye is about getting back to the basics. REGISTRATIONS HAVE NOW CLOSED FOR THE 2017 KTM NEW ZEALAND ADVENTURE RALLYE. We are excited to offer local and International riders the chance to take part in the 2017 KTM New Zealand Adventure Rallye by partnering with PARADISE MOTORCYCLE TOURS to offer KTM Adventure Rentals. Check out the Rental Information Dossier for further details on Rental options.